Here is the latest project I did for National Scrapbooking Day. I wanted something to celebrate the day but also something bright and cheerful. I think this card fits the bill just perfect. I started with cutting a piece of Melon Mambo in half then folded the card in half for my card base. I then cut a piece of Daffodil Delight to 3-3/4" x 5" and a piece of Whisper White to 3-1/2" x 4-3/4". I glued the Whisper White onto the Daffodil Delight. 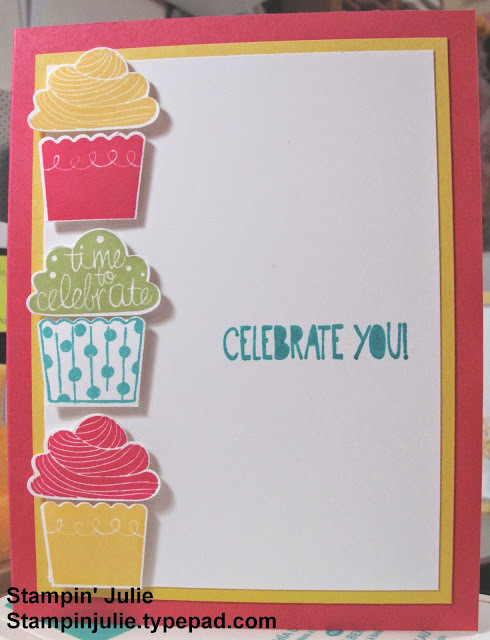 I stamped the Celebrate You onto the layered Whisper White. I then got started on the cupcakes. First, I stamped all the components of the cupcakes onto a piece of Whisper White. Next, I used the Cupcake Builder punch and punched out all the pieces. I then used some Stampin' Dimensionals to pop up the cupcake pieces. Finally, I glued the layers onto the Melon Mambo card base and the card is finished.